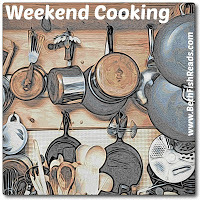 Are you looking for delicious and quick recipes to feed your family? 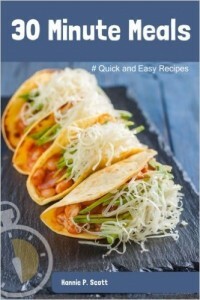 This simple and easy cookbook has step-by-step recipes that are easy to follow and only take 30 minutes or less to make! With a nice variety of recipes, this book is your “go-to” cookbook when it comes to cooking for your family and friends. This book includes recipes for any occasion! I love recipes that are quick and easy. This book is filled with recipes like that. They all use ingredients that we probably have in our pantry or fridge already, and they only take around 30 minutes. The book includes a list of abbreviations and conversions. There are a variety of recipes including Simple Shrimp Gumbo, Asian Meatballs, Sweet & Spicy Salmon, Creamy Chicken Spaghetti, Roasted Asparagus(love! ), Sriracha Zucchini and Mediterranean Vegetables. I’ve only tried one recipe so far, but as I was going through the book, I saw many that I want to try. Few ingredients and 30 minutes. I love this cookbook! It will be one I go to over and over. If you like few ingredients, quick and easy, please check this cookbook out. I think you’ll love it as much as I do. Sounds like my kind of weekday cookbook. I’ll have to look for a copy. This sounds good! Especially lately… I’m always looking for a quick and easy meal that’s not just heated in the microwave! Some of these recipes sound tasty to me. Thanks for sharing it with us. Got to love quick, easy and delicious. I’ve got Rachael Ray’s 30 Minute Meals, which my lovely sister-in-law gave me. Yes, 30 minutes sounds good to me. Thanks for featuring this book! Quick can be so good – and low work long and slow too. Cheers from Carole’s Chatter! Sounds perfect, another one for my library wait list. Working full time I sometimes need the quick recipes. This sounds like a great book to have on hand. There are always days when there just isn’t much time to cook and I like the idea of whipping up something quickly instead of running to the nearest drive thru. I’ll have to look for this one!